Are You Sure You Are Compliant With Your Current Labor Law Posting? Have a hard time keeping track of minimal and major updates to the Federal, State and Local Labor Laws in your area? Not sure what and when you need to post when an update is made? You’re not alone. We have the perfect service for you. Our Labor Law Poster Subscription Program keeps you up to date on what has changed, what needs to be posted and when and how it should be posted to help you avoid compliance issues and fines. What do you get and why do you need it? Automatically updated every time changes occur for significant revisions in mandatory federal and/or state posting laws. Up-to-date attorney approved State and Federal Labor Law Posters, or print ready .pdf versions of the new/revised postings. Why do you need Labor Law Posters? Both Federal and State government regulations require all employers, with at least one employee, to post mandatory labor law postings. Failure to post up to date labor law postings can result in fines. Federal and State labor law postings change often; employers are required by law to be aware of any changes. 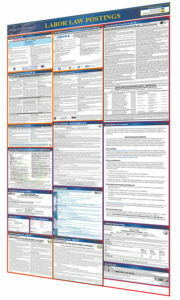 Existing Clients CLICK HERE to order additional labor law posters.